Yesterday I stopped by Truxton's American Bistro in Santa Monica for brunch. It was a pretty cool place for brunch even though we waited over an hour but I did expect a 45min wait since it was the day after Halloween and it's LA everyone's going to brunch on Sunday, I didn't like the fact that the waiter sat down people who arrived after us. But I figured he was new by the way he was acting he seemed very nervous. Anyways on to the food I really wanted the French toast with peaches but they were currently out of French toast what a bummer also they were of sausages which I requested. 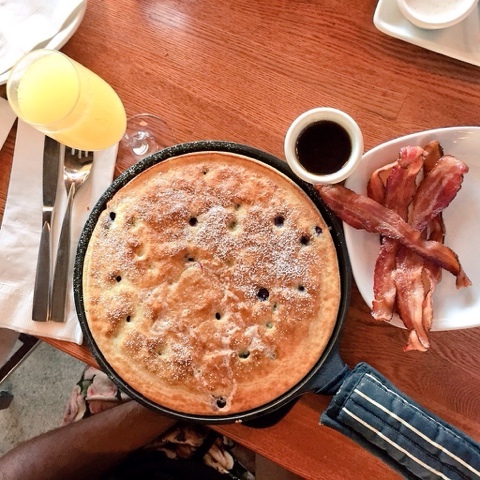 So I opted for the Berry 10" skillet pancakes with a side of bacon. It comes with burbon syrup I really didn't taste the difference between that and maple syrup or maybe I was too into my mimosa ha! The pancakes are good and very filling my friends and I requested mimosas.... The waitress spilled the bottle of mimosa's on me. Today just isn't my day as you can tell but I laughed it off I could tell she didn't mean to do it. I don't really see myself coming here often unless I'm heading to the beach later in the day but you should check it out they have $4 bottomless mimosas you can't miss that and walking distance to the beach so no excuses for drinking and driving. That's all for today thanks for reading!